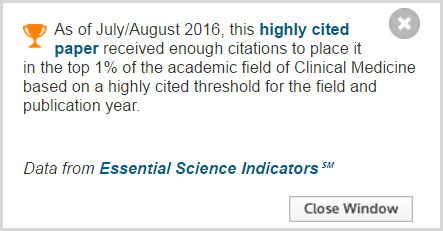 ESI Hot and Highly Cited Papers make it easy to pinpoint the most influential research in your journals. For subscribers, ESI is integrated with Web of Science Core Collection, which means that you can easily identify the top-performing papers in your results via ESI icons. You can use the ESI Top Papers refine option in WoS Core Collection to limit your results to the Hot and/or Highly Cited Papers published in your journals. Marketing could use this integration to highlight the high-impact research from particular titles, and editors may want to identify the authors that contributed to this influential work.